The Extia is designed to extend filtration lifetime by more than 40%. 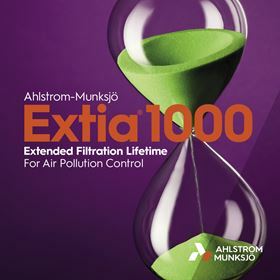 The American Filtration & Separations Society (AFS) has presented its New Product award to Ahlstrom Munksjö for its Extia filtration media. The award was presented at the AFS Annual Awards Luncheon at FiltCon2019, the AFS' spring conference, which took place between 1-3 April. Extia is designed to extend filtration lifetime for Air Pollution Control (APC) applications. APC filtration media is used in a many industrial applications to reduce or eliminate the emission of particles into the atmosphere from stationary sources. Ahlstrom-Munksjö’s filtration business, part of its Filtration and Performance business area, develops and produces filtration materials for engine oils, fuels and air, as well as industrial air, used in vehicles or for industrial purposes. The filtration business also has applications and is further developing filtration solutions for e-mobility. The Extia 1000 is the first product on the Extia platform.